Officials at the signing ceremony in Riyadh. 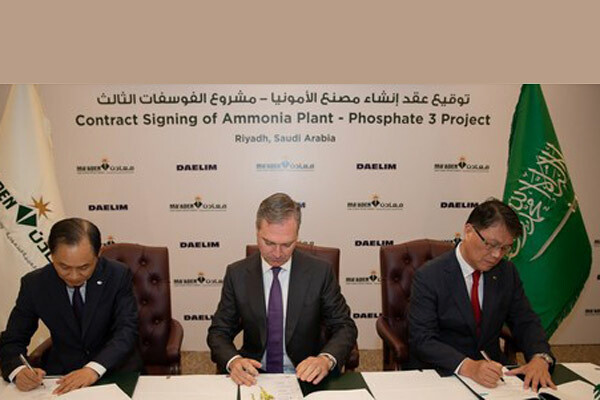 South Korea's construction giant Daelim Industrial Company has been awarded a SR3.4-billion ($892 million) contract by Saudi Arabian Mining Company (Ma’aden) to build the first plant in the company’s third large-scale phosphate complex (Phosphate 3) in the kingdom. As per the deal, Daelim Industrial Company and Saudi Daelim will jointly carry out the engineering, procurement and construction (EPC) services for the development of the 1.1-million tonne per annum ammonia plant in Ras Al Khair area on the eastern coast of Saudi Arabia, said a statement from Saudi Ma'aden. The move is aimed at boosting Ma’aden’s phosphate production capacity to nine million tonnes, thus securing the kingdom’s global position as a top phosphate producer and exporter, remarked Ma’aden president and CEO Darren Davis after signing the agreement with Daelim Senior Executive vice-president and CEO Heon Jae Yim at the Ma’aden headquarters in Riyadh. This is the first of the Phosphate 3 plants to begin construction. The entire project is expected to cost SR24 billion ($6.4 billion). The project will generate non-oil GDP growth of SR25 billion ($6.7 billion) and approximately 7,000 direct and indirect jobs. According to Davis, upon completion of Phosphate 3, Ma’aden will increase its capacity to supply phosphate fertiliser to global markets by three million tonnes per year, with a total production capacity of nearly nine million tonnes.